The loss of Rodney McLeod may end up having a ripple effect, testing the Eagles' depth at multiple spots in their secondary. When the Philadelphia Eagles restructured the contract of Fletcher Cox, it sent a clear signal to the rest of the NFL that if you have a good player you wouldn't mind trading, Howie Roseman is willing to talk. Let's take a look at what positions are in most dire need of help as we approach the trade deadline. We've all seen the rumors that have linked the Eagles to the Steelers' Le'Veon Bell and the Bills' LeSean McCoy. In the case of McCoy, it appears as though the Bills have an unrealistic asking price (via Ian Rapoport of NFL.com). One key source believes McCoy stays in Buffalo not just for this year, but also for the 2019 season. There was no talk of compensation during the conversation between the Bills and the Eagles this week, and the call was described as more feeling out than anything. But the belief is a trade for McCoy would be expensive, perhaps as much as the Seahawks were asking for Pro Bowler Earl Thomas before his injury. And the Eagles don't seem ready to pay a second-round pick and more for McCoy, even though they have two of them in the 2019 draft. To begin, the idea that the Eagles have an extra second round pick doesn't mean they should be willing to spend it foolishly. Secondly, the Bills asking for a two (or more!) for a 30-year-old back in decline who has been in the league for 10 years and has 2700 touches is laughable. The Eagles aren't in horrible shape at running back. The trio of Corey Clement, Darren Sproles (returning "soon," per Doug), and Wendell Smallwood certainly isn't great, but they're good enough to be effective in the Eagles' offense. Smallwood, for example, is averaging 4.7 yards per carry, and he's very clearly be the No. 3 guy in that group. The Eagles could add a running back, but the need for a big name guy isn't there. If the Eagles deal for a back, I would expect him to be a low-money player the Eagles could add to their current RB rotation, not a "feature back" type of guy. While Timmy Jernigan was something of an inconsistent player last season, his absence has been felt by the Eagles' interior defensive line this season. Fletcher Cox has played 86.3 percent of the Eagles' defensive snaps this season. The next closest defensive lineman in terms of snap counts is Brandon Graham, who has played 66.3 percent of the snaps. One theory for that was that the Eagles were perhaps allowing Cox to chase personal goals, such as Defensive Player of the Year. That ain't it. The reason is because he can't come off the field, because he's the only defensive tackle on the team with the ability to stop the run and rush the quarterback. After Cox, there's Haloti Ngata, a one-dimensional player who can still anchor against double teams in the run game and plug up the middle of the line, but has not been effective rushing the passer. After Ngata, the Eagles just have a bunch of bodies. In other words, on plays in which the Eagles have Ngata or one of the other defensive tackles on the field, that spot is basically a wasted player whenever the opposing offense is passing. I believe that defensive tackle will be the Eagles' biggest need in the 2019 NFL Draft, but it is also an underrated need in the short-term. The most glaring element missing from the Eagles' offense is a speed guy who can take the top off a defense. That role was supposed to be filled by Mike Wallace, who broke his fibula Week 2 against the Buccaneers. With Wallace down, the most logical replacement for his role was Shelton Gibson, but the team clearly does not trust him to be on the field for an extended period of time, as he is seventh among the Eagles' wide receivers in snaps played (52). The Eagles' need for a wide receiver is somewhat dependent on whether or not they think Wallace can return this season, and what he will look like if/when he does. But even if the belief is that Wallace can return and be something close to the player they hoped he'd be when they signed him, a long-term solution at that speed receiver spot remains, as Wallace is almost certainly nothing more than a one-year rental. If the Eagles can find a receiver with deep threat ability whose contract runs through at least the 2019 season, then that would make a lot of sense. After losing Rodney McLeod for the season with a torn MCL, the Eagles are currently starting a fourth-round rookie in Avonte Maddox at safety, who has never played the position in his life, and only began getting reps in practice there a few weeks ago. While Maddox has actually been reasonably effective there, considering his complete lack of experience on the back end, it's not an ideal situation for a team that is trying to repeat as Super Bowl champions. Maddox's move to safety also depletes the Eagles' depth at corner, which they need at the moment. 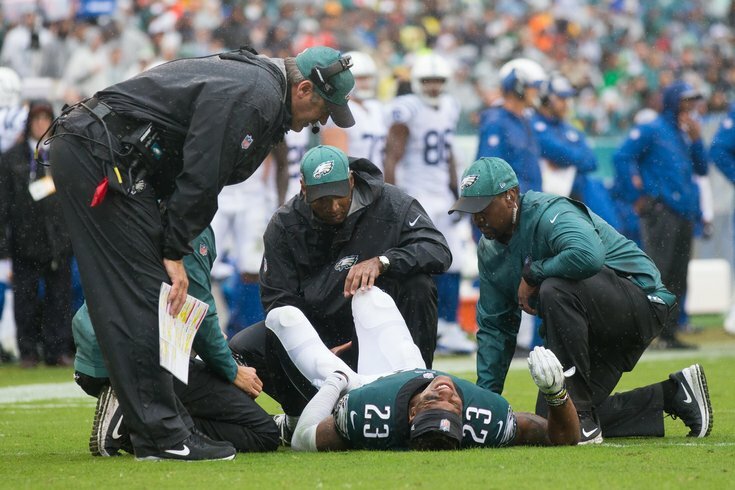 With Sidney Jones having been given the dreaded "week to week" label by Doug Pederson after injuring his hamstring against the Giants last Thursday, Maddox could have easily slid right into Jones' slot corner role. Now, if the Eagles intend on keeping Maddox at safety, as I suspect they will given Corey Graham's obvious struggles there against the Titans, Jim Schwartz will have to shuffle his personnel to account for the losses in the Birds' secondary. Of course, safety also happens to be an under-performing position league-wide, meaning that it's not all that likely that a good one will be available for a reasonable cost. Adding a corner with some inside-outside versatility would also make some sense, if the Eagles like what they have seen of Maddox at safety.